I wrote this essay originally in 2016 for a university module on Heritage, History and Identity. The original question was “Identify a type of food or drink that you consider to represent some aspect of your identity (ethnic, regional, religious, social class, gender, family, etc.). Explain why this food or drink has such meaning.” I have shared it here because I wanted to share how green smoothies have influenced my life. Each person has an identity. Identity is influenced by different factors including, genetics, upbringing, society and culture. These shape aspects of our identity as varied as style, class, ethnicity, nationality, career and diet. The way these aspects of our identity are represented in our lives often overlap, resulting in one item, activity or belief that represents several different aspects of our identity. Food and drink are one example of this, as they can represent our ethnicity, a particular passion, shared memories, and other aspects of identity. This leads to food and drink becoming an integral part of identity, with an increased value placed on those items that are tied into an individual’s identity. Recently, food has become further entwined with identity due to the rise in food-based lifestyles, such as ‘The Paleo Diet’ as popularised by Loren Cordain PhD and “clean eating” as encouraged by social media influencers [Freeman, 2015]. This has seen an increase in people basing their lives around a particular way of eating and exercising, including myself. Through a desire to be healthy and involvement with the blogosphere, I have experimented with various food-based lifestyles with an emphasis on “clean eating” and green smoothies. Consequently, green smoothies have become an integral part of my own lifestyle and diet but also part of my identity and how I am included or excluded from social groups [Mintz and Du Bois, 2002]. One aspect of my identity that green smoothies represent is the one I refer to as the “health freak”. This ties in both my love of healthy eating and the social alienation that has come around due to the lengths I go to. Blending together spinach, raspberries, avocado and almond milk appealed to me initially because I bought into the idea that you can cure your own health through the food you consume. This is because eating healthily is not just about being the correct shape or weight for me but also about giving my body the best chance to do what it’s meant to do. As I used green smoothies to cram more nutrients into my diet, I noticed a change in various conditions. This led me to rely on green smoothies to maintain my health, positively incorporating them into my “healthy eating” identity. The other side of the “health freak” is that green smoothies have also distanced me from my family and friends. Though I have never been begrudged enjoying green smoothies, comments such as “how can you drink that?” and “you murdering more vegetables today?” have been made by friends and family. Such comments, though meant in jest, underlined the fact that drinking green smoothies was not common in the social groups I was a part of. Thus, I was placed outside of the group’s social norms by taking a healthy diet in a different direction. This led to the concept of “health freak” developing out of accepting people’s view that I was different to the social norm because I drank green smoothies. Accepting the “health freak” aspect of my identity gave me the freedom to look for green smoothies beyond my social groups. My interest led to me searching online for healthy eating inspiration, becoming one of the 6454 monthly internet searches for green smoothies [Jaaxy, 2016]. 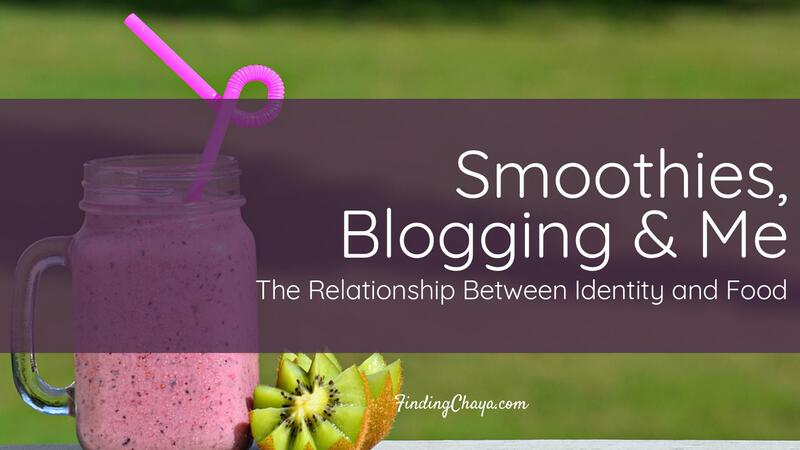 Having begun to develop an online presence, the blogosphere was an obvious place for me to look for a community based around green smoothies. Eventually I discovered Simple Green Smoothies, along with over 500,000 other people [Sellner and Hansard, 2016]. I adopted their online community as a way to normalise green smoothies when it was more unusual amongst my social group. My inclusion in the online healthy eating community, represented by Simple Green Smoothies, served to reinforce my identity as a lifestyle blogger. My inclusion of food-related posts on various online platforms began to include vegetable smoothies. The result was a cyclical confirmation of my identity where each post took me more deeply into the healthy eating community within the blogosphere, which led to me creating more posts. To conclude, green smoothies represent my identity as part of the online healthy eating community while also excluding me from other social groups. In the past they have marked me out on several occasions as moving against social norms, resulting in me referring to myself as a “health freak”. They have also been an important part of creating my blogger identity and moving me into an online community, where I am no longer consider myself to be outside the social norm. This is exemplified in my regular use of the hashtag #healthfreak when sharing photos of green smoothies, and other healthy food, on Instagram. Therefore, green smoothies represent two aspects of my identity that are merging into one through social media. Lee, H. H. M., van Dolen, W., & Kolk, A. (2013) ‘On the Role of Social Media in the “Responsible” Food Business: Blogger Buzz on Health and Obesity Issues’, Journal of Business Ethics, 118, (4), pp 695-707. Mintz, S. W., Du Bois, C. M., (2002) ‘The Anthropology of Food and Eating’,Annual Review of Anthropology, 31, pp 99–119. Mintz, S., & Nayak, S. (1985) ‘The Anthropology of Food: Core and Fringe in Diet’, India International Centre Quarterly CULTURE, 12, (2), pp 193–204. Tobey, L. N., & Manore, M. M. (2014) ‘Social media and nutrition education: The food hero experience’, Journal of Nutrition Education and Behavior, 46, (2), pp 128-133. I have been known to use beetroot as the base ingredient rather than spinach, resulting in a purple rather than green smoothie.